Seoul street food, originally uploaded by oliverkhaw. You’ll find these snack carts/vendors along streets near universities in Seoul where students fill their stomachs with cheap but filing snacks like fish cakes (odeng), tteokbokki, sausages, soondae, toast sandwiches. Once you’ve seen a couple of these the vendors, you’ve probably seen them all. The Koreans are more a restaurant society rather than street food connoisseurs. The customers here are predominantly students who don’t have much to spend or clubbers looking for a quick food fix. 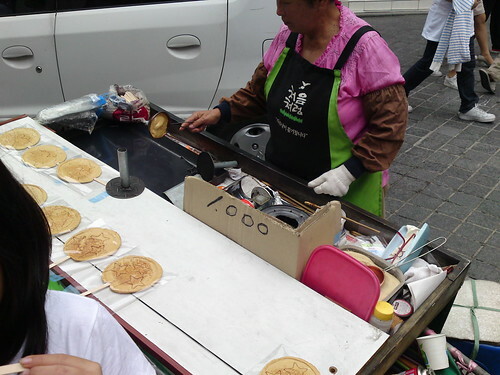 Chuncheon street food, originally uploaded by oliverkhaw. This is one of those fast disappearing street foods in Korea. Here’s an old lady preparing sweet after school treat of caramel on a stick. It sells for KRW1,000 per piece (about US$1) now but my wife tells me these treats used to go for 10 cents during her school days. Apparently if you take up the vendor’s challenge and manage to remove part of the caramel marked by whatever shaped cookie cutter used by the vendor perfectly and intact you can have another piece for free. Rewards do vary with the “difficulty” levels of each shape. I wonder if the future generation will ever get to enjoy these treats with all the healthy eating craze that’s being advocated everywhere. Gas Masks, originally uploaded by oliverkhaw. A sign of times indeed. 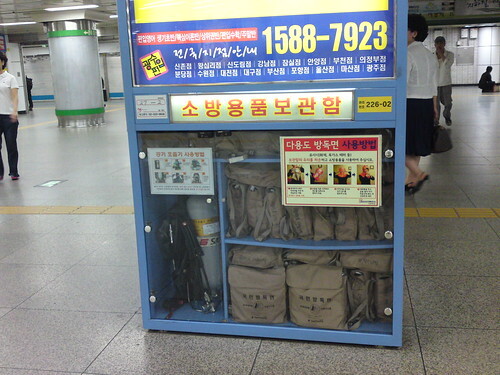 At every subway station in Seoul I noticed this blue box at various locations for gas masks and oxygen tanks. Hope nobody ever has to make use of them. 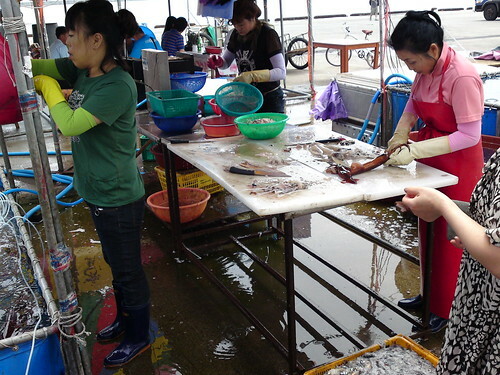 Sokcho squid market, originally uploaded by oliverkhaw. While we were waiting for the bus back to Chuncheon, we wandered around Sokcho and stumbled across this squid market. Stalls were all lined up next to the seaside with large blue tanks filled to the brim with live squid swimming in ice cold water. Customers were either buying squid fresh to bring home or have them sliced and served sashimi style on the spot with ice cold beer.